What: Yet another Australian American India Pale Ale. Do they even have their own hops in Australia? It seems like every other IPA I’ve imbibed while holidaying in Melbourne has been another American IPA. I’m not complaining, though – they’ve all been pretty good so far. Mornington Peninsula Brewery is a craft brewery on Melbourne’s Mornington Peninsula (hence the name). According to the notes on its website, this beer is light-orange tinted in amber (I wouldn’t know; I tried it in a 330ml bottle), heavily hopped, and delivers rich stone-fruit aromas of peach and apricots. I’m pleased to note that the bottle says this beer has no additives or preservatives. Where: I ordered this at a Japanese restaurant and bar (I can’t remember the name of it) on the Yarra Riverbank in Melbourne, Australia. It was a beautiful, sunny afternoon in very early spring. My wife and I had just got back from a trip to Saint Kilda, and then a long walk along the river. Suffice it to say, I was feeling parched. Tastes like: Spring in Melbourne. This locally produced IPA really did it for me – it was rich in flavour, with wonderful notes of toasted caramel, as well as a little citrus and stone fruit essence. It has a nice, hoppy punch, with a lingering finish. I drank it straight from the bottle, so I cannot comment on its colouration. This IPA did have a slightly oily mouth feel that I noted after my first sip. Over time, however, I noticed that less and less as I got my beer buzz on in the Victorian sunshine. Is it the best beer ever? Although I had them on different days, I think I prefer the Feral Hop Hog IPA that I tried the day before – although the Mornington IPA is still a very worthy beer. In fact, I’d say it’s probably a must-try for any beer lover visiting Melbourne. The following day I’d drive down to the Mornington Peninsula and check out the brewery for myself. I’ll write a bit more about that at a later date, but I’ll tell you right now that I had a very good time there indeed. 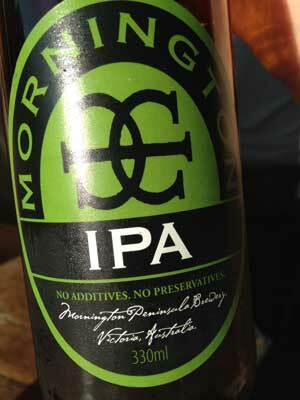 The Mornington Peninsula Brewery knows how to produce some great beer – this one included.